And here is a SAMPLE VIDEO. If you visit the website, you will find numerous practice videos, scores, congregational booklets, etc. PLEASE let me know if you find any errors! Thanks! If you visit http://www.ccwatershed.org/Mass, you will also find a URL link to several other composers' Masses, all of them offered for free. It's not explicit in the score, but the fact that you've set the Sanctus, Memorial Acclamation, and Amen to flow from the priest's melodies that ICEL provides for the new translation is a major plus. 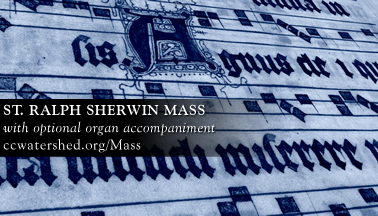 Would that more composers at least consider the possibility of integrating their work with the music already embedded into the Missal, regardless of their compositional language. Jeff: wonderful! Hopefully no one will be *martyred* for using it rather than Massive Cremation! Thank you both, for these comments! I send this link to music directors in this area. Thank you so much. They are very beautiful. We'll be introducing this at St David of Wales this week. In pasting up a double-sided half sheet for the pews (title, Gloria-Sanctus-Agnus only) I couldn't help noticing the incorrect ICEL copyright date! curve of Royce Nickel's S. THERESE MASS. The congregation actually "had a say" in deciding 3 of 4 for Ralph Sherwin over another quite worthy Mass setting Glory. What was fulfilling while they exited and voiced their vote was the use of the word "chant" to indicate their preference. Charles, I am so honored and humbled that you find this Mass to be a blessing for your congregation. Just started this setting with the congregation. Over the last few weeks of OT the Gloria was introduced. On the first Sunday of Lent it will be the remainder of the Mass. Jeff did a grate job with this. The music Gloria has an air of the great mystery and solemnity about it that really glorifies God Almighty! The rest of the Mass flows nicely as if it were one piece of music! Jeff... nice work, as usual! You have the corner on 3rd Millennium Gregorian Chant.